Luke Goodman Cinematography Blog: Travelling. Flight. Noise Canceling Headphones. Travelling. Flight. Noise Canceling Headphones. I don't get to travel as much as I'd like to, but I do end up flying four to five times throughout the year. I flew to Japan last spring and during that trip I found out what a pleasure noise canceling headphones can be. At first glance, they seem like a great solution to tune out talkative adults and (more likely) crying infants on the flight, but after many uses I have found them to solve a few other issues. Jetlag being the largest. I noticed that when I fly with these on, I feel far less groggy, disorientated and fatigued. I believe (however not backed up by any science whatsoever!) that tuning out all of the external noise and the loud roar of the engines creates this less stressful flying experience. I have a pair of noise canceling headphones from Sony. I found them to be the best buy for the price. These headphones can get fairly expensive, some nearly the cost of a new computer. This pair has functioned very well, the battery life is long and they are relatively compact. 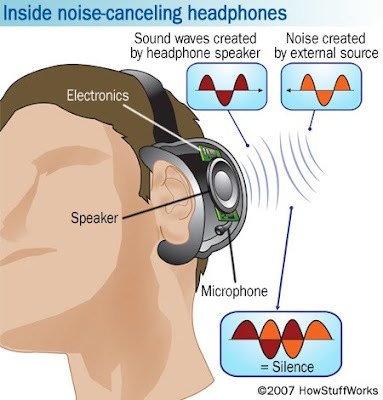 Noise canceling headphones work in two ways: First, the simple part; most of them are closed ear design, meaning they physically block the sound by covering your entire ear.. The manufacturers even use special sound-obsorbing foam to keep out even more external noise. The second half of canceling noise is a little more high tech. A small microphone and speaker mimic the exact sound coming from outside the headphones. Two identical sound-waves that point towards each other cancel each other out! Overall, this makes for a much more tolerable flight experience. Give it a try next time you fly. Head over to your local bestbuy or fry's, pick out a pair, use it on a trip, and if you don't like the result, return them- my bet? You won't take want to take them back. Interesting article you wrote! Didn't know you could even buy something like that. Now all I want is one that I can wear when sleeping in a hotel.